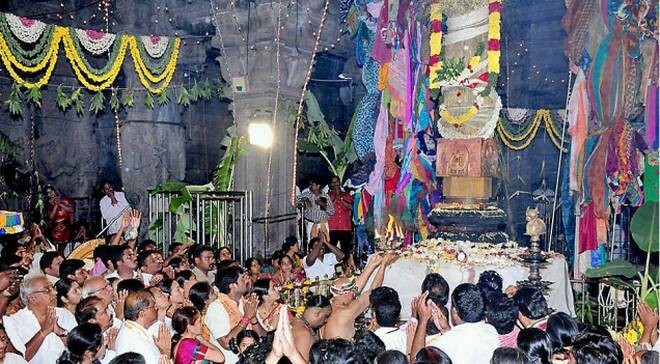 Tirupati, Mar 06: The famous shrine of Lord Shiva at Srikalahasti in Chittoor district validated a hefty assemblage of devotees, who crowded the temple to have a darshan of Lord Srikalahastheeswara on the auspicious occasion of Maha Shivaratri celebrated on Monday. The other temples of Lord Shiva situated across the district also witnessed a huge turnout of devotees right from the morning. The Srikalahastheeswara temple was kept open to devotees after sun-rising rituals, which were held in the forenoon hours and the turnout of devotees went on till late in the night. Temple officials and security had a tough time controlling the continuous flow of devotees. There was a tumult in the long queues at several points after the devotees, waiting for a long time, turned impatient. As a result of the continuous surge of devotees, it took 5-6 hours for them to have a darshan of Lord Srikalahastheeswara. The temple management made elaborate arrangements including free food to the devotees. The other temples in the district including Mogili, Sadasivakona, Kailasakona and Mukkoti, which were dedicated to Lord Shiva, also witnessed a huge turnout of devotees right from the morning.